An interview with ‘John Doe’, one of Nicola’s private students who lives with Parkinsons Disease. “Having been a pupil of Earth Balance Tai Chi for some two years, I had often thought about one to one lessons. So earlier this year I decided to treat myself. Truly, the best move I have made in a long time. 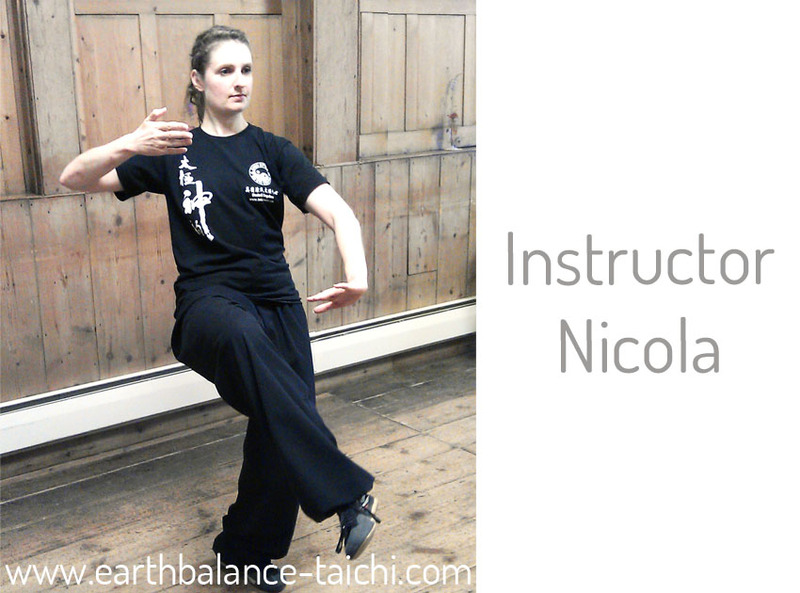 Working through the movements with the encouragement and undivided attention of Nicola has made a vast difference to my Tai Chi practise. With my posture being corrected, and the moves being explained in great detail, knee alignment (a weak point before) put right not only affected my practise, but my everyday awareness of my physical and mental being. All with Nicola’s enthusiasm, support and sparkling good humour. What would your plumber or electrician charge you for work on your home? What does your car mechanic charge per hour for repairs and M.O.T? Well, I think I’m worth the fee that I pay for a one to one lesson..
“It’s rare you come across someone with the amount of passion for their subject that Nicola has and as a student you can’t help but be swept along by her enthusiasm. In class Nicola’s clear explanation of the actions and their purpose demonstrates her experience and insight in the subject. I found her teaching style to be warm and generous nurturing an open and relaxed class. “After training in Karate for several years I had to stop for personal reasons. However, I found that after a few years I missed it very much but my attempts to return proved unsuccessful as my previous club was no longer operating. For several years I had been drawn to Tai Chi but had never pursued this interest so now took the opportunity to research it further. The integrity and professionalism of the Instructor is very important to me so I did some quite in depth investigation on the internet. During this search I came across ‘Earth Balance Tai Chi’, which seemed to fit my particular requirements so I took the opportunity to go along to a tester session. I wasn’t disappointed and signed up for a six week beginner’s course. Nicola’s teaching style is quite relaxed and delivered with, clarity and patience and at a pace that allows learning to be reinforced. Time is taken to explain and demonstrates each move before the students do it themselves. Nicola also takes time to move amongst the class and adjust students’ posture, where necessary. I am currently coming to the end of my second six week session and would happily recommend any potential students to come and join us. You will be made very welcome and initial nerves will quickly subside as you train in this fascinating art”. “Very enjoyable class, delivered with easy to follow instructions. Nicola is a great teacher and the information she delivers is great! I would recommend this class to young & old. It’s given me a new hobby that is good for me. Thank you for bringing Qi Gong classes to my area”. “Nicola is an enthusiastic and encouraging instructor who makes every lesson enjoyable and something to really look forward to . Her explanations of the concepts behind the movements plus the ethos of Tai Chi are clear and very informative. I always leave each class with a sense of having done something very worthwhile for both my mental and physical health”. “Nicola Jones runs a weekly beginners class which I have attended. During the sessions she has taught the basic moves in Chen Style 11 Form. As the class progresses we have learnt the meaning behind the moves, why we make them and correct our postures/moves when appropriate. Weather permitting we have practised outside. A good mix of ages and abilities attend this course, and we are all catered for without exception. “My introduction to Tai Chi has been a gradual awakening on all levels to the depth of knowledge incorporated in this art of movement. I am starting to see the benefits physically, and have also found it useful as a form of relaxation. The balance between providing an informative engaging session and also a friendly accessible atmosphere is what stands out about Nicola’s classes. Natural teachers with a passion for their subject are rare , in my opinion. I think having an instinct for what people can absorb at what stage is not easy. “The classes are fun, relaxing and I always leave feeling I’ve made progress. Nicola is a good teacher and is always encouraging, positive and let’s us work within our capabilities. The classes are an oasis of calm”. Patrick Palmer, Dublin, 17 September 2011.